Nearest: Tube & Railway Station: Stratford (London) 123 yards (112 metres), DLR Station: Stratford 0.1 miles (0.2 km), Motorway: M11 Junction 4 4. 1 miles (6.6 km). One of three hotels located actually within the Westfield Stratford City shopping complex, the largest shopping mall in Europe. The Staybridge Suites London Stratford City enjoys a location where facilities and amenities are abundant and transport links are excellent, a legacy of the London 2012 Olympics. Half a mile from the Olympic Park and less than 3 miles from the Docklands/Canary Wharf area and the ExCel Exhibition centre. East Londons' airport known as City Airport is 4 miles from the hotel. The City of London which is the capitals financial centre and often referred to as the square mile is just under 4 miles from the Staybridge Suites Stratford City. As far as the Olympic Stadium goes, hotel guests are within a 5 to 10 minute walk of the main area. With its welcoming lobby the Staybridge Suites London Stratford City offers guests a home from home with all the facilities of full service apartments. Accommodation options include studio or one bedroom apartments and whatever your choice you'll find a fully fitted and equipped kitchen inside. Apartments are larger than a standard hotel bedroom, decorated in neutral tones with splashes of vibrant colour. Each apartments comes with luxury king-size bed and comfy chair with work space area, flat screen TV and complimentary internet throughout. Daily housekeeping. 24 hour room service. A Managers Reception Evening is held 3 nights a week Tuesday to Thursday where complimentary wine, beer, soft-drinks and nibbles are served. The hotel's living room affords a panoramic view over the Olympic Park. Its also the place to relax and chat with friends and colleagues. Smoking is prohibited throughout including the apartments. The Staybridge Suites is business friendly and provides the following services: Copying, Courier, Fax, High-speed Internet Access. The Guest Services Team are available 24-hours a day to assist you with all your business centre requirements. Onsite is the 'Body Shop Gymnasium' which is open 24-hours a day and is equipped with the latest cardiovascular equipment including treadmills, cross trainers, bikes and rowing machines. Other features of note are complimentary laundry room, grocery service, same day dry cleaning and laundry. All public areas are air-conditioned. You'll find all the groceries you need at the onsite 24-hour Pantry. Parking: Use the Westfield car park (charges apply). Intercontinental London O2 Arena: is 2.7 miles (4.4 km) away, has a guest satisfaction score of 93% and rates start from about £136. Staybridge Suites Vauxhall: is 6.1 miles (9.8 km) from here, earns a customer rating of 96% and base rates begin at about £127. Intercontinental London park Lane: 6.8 miles (11.0 km), rated at 89% and with rates from around £274. Compared to other London hotels: This hotel has been rated 91% by past guests. The London average is 80% and the average for 4 star hotels is 83%. Therefore this hotel is above average for its sector (star rating) and for London as a whole. Intercontinental Hotels across the chain average 90% so this hotel is just above the average rating for Intercontinental hotels. Milesfaster ranking: 52nd from 866 London hotels, 2nd of 4 Intercontinental Hotels, and 19th of 328 four star rated hotels. Another to Consider: Another hotel that is much like the Staybridge Suites London Stratford City and not too far (2.6 miles, 4.2 km) would be the 4 star Fox Apartments, where prices begin from around £250 and which has a 90% guest satisfaction rating. The Fox Apartments also offers: free WiFi. Looking for lower base rates? Then another option might be the Holiday Inn Stratford City. 0 miles from the Staybridge Suites London Stratford City (0.0 km), has scored 89% from former guests and whose lowest rates start at about £85 (theres free WiFi too). Prefer something with a higher guest rating? Then the 5 Star Batty Langley's may be one too look at, and some 3.5 miles (5.6 km) from this hotel. The Batty Langley's has an extremely high guest rating of 96%, one of the best rated London hotels. 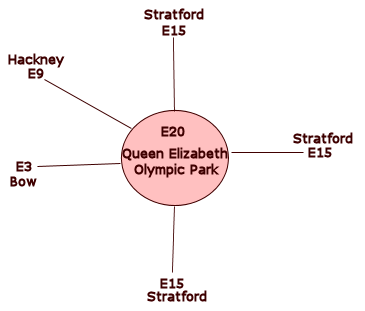 The 50 nearest hotels around this area (10b Chestnut Plaza, E20 postcode) which we have have on our website extend out to a 3.1 miles (5.0 km) radius. The numbers by star rating are 4 five star hotels (average rating 90%), 18 four star hotels (average rating 84%), 16 three star hotels (average rating 81%), 9 two star hotels (average rating 70%) and 3 one star hotels (average rating 62%). Top 4 star hotel is Staybridge Suites London Stratford City (this hotel) at 91%. Coming out as the top rated hotel is Intercontinental London O2 Arena (5 star) at 93%. Base Rates: We compare area starting room rates by using base rates. Bear in mind we use the published base rates which do not reflect short term offers and deals. They do however give a decent relative comparison. Looking at all hotels in the area the average base rate is £79 per night. They range from a low of £30 at Silkhouse Hotel (2 Star, 58%) up to £250 at Fox Apartments (4 Star, 90%). Rates break down to the following for each star rating: Five Star average: £146, Four Star average: £95, Three Star average: £68, Two Star average: £49 and One Star average: £41. Using our in-house algorithm we rank hotels based on guest ratings and weighted for related factors. We have a ranking for Staybridge Suites London Stratford City 2nd of 50 and 1st for the 18 four star hotels in the area. Our base rate rank for the hotel is 38th of 50 (12th of 18 four star hotels.). We use the base rate ranking and review ranking for the hotel to get an overall ranking of 12th of 47 for sheer value for money (City View Hotel was top). Sold to an undisclosed Asian buyer in January 2013 for £58 million pounds in a deal that included the Holiday Inn Stratford City. IHG continue management. Managed under a franchise agreement between IHG (Intercontinental Hotels) and Cycas Hospitality, a subsidiary of Cycas Hotel Partners when opened in 2012.